Dr. Abdulian specializes in open and arthroscopic treatment of the shoulder, hip and knee. He is well trained in joint preservation as well as joint replacement. He also specializes in fracture care as well as surgical and nonsurgical treatment of musculoskeletal injuries. His treatment approach is focused around restoration of function and decreasing pain to get patients back to the activities they enjoy. Dr. Abdulian was born and raised in Los Angeles. He attended the University of Southern California where he earned his bachelor’s degree. Following graduation, he moved to Washington D.C. to attend Georgetown University. There, he completed a master’s degree in physiology and biophysics. He then went on to The Tulane University School of Medicine where he earned his medical degree. Concurrently, he also completed a master’s degree in public health at Tulane. Following medical school, he attended the prestigious Case Western Reserve University Hospital in Cleveland, Ohio for his training in orthopaedic surgery. After his residency, he and his family returned to his native Los Angeles. Here, he completed a fellowship in sports medicine and shoulder reconstruction at Keck Hospital of USC. 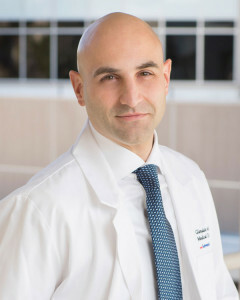 Through his fellowship, he received advanced training in arthroscopic and minimally invasive surgical techniques to treat various conditions of the shoulder, hip and knee with an emphasis on joint preservation. Concurrently, he completed a fellowship in hip arthroscopy, an emerging technique to treat hip injuries through a minimally invasive approach. During his fellowship, Dr. Abdulian served as a team physician for the USC Trojans, working closely with athletes of all levels, treating their sports injuries and working to get them back to the sports they enjoy. Dr. Abdulian is an active member of the American Academy of Orthopaedic Surgeons, the Arthroscopy Association of North America, and the American Orthopaedic Society for Sports Medicine. In his free time, Dr. Abdulian volunteers his time as a team physician for various local high school football teams. He also enjoys outdoor activities and is an avid snowboarder.